You need the proper tools to do quality construction, remodeling, and repair work. Ward's Lumber has a full range of hand and power tools for you to use. From hammers to drills, we have everything you need to complete your project. Rely on us to also provide you with a great selection of welding supplies and accessories. If you prefer to work faster and use less energy, try our power tools. We are an authorized DeWalt dealer, and we offer all the great corded and cordless tools they make. If we don't have the DeWalt tool you want in stock, we can special order it for you. 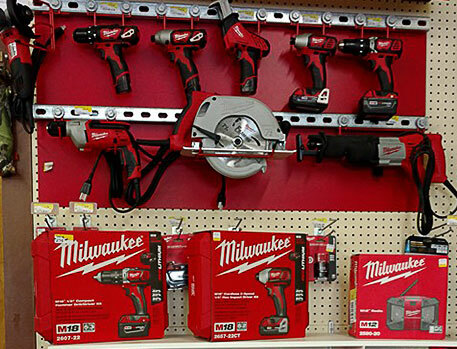 Our wall display of tools includes drills, grinders, saws, roto-hammers, and more! Improve your welding skills with merchandise from our store. Our selection of Welding supplies and accessories include brushes, wheels, and welding rods. When you use our products, you will do effective maintenance and repair for metal parts.